By Mark Eisner: Scott Quigg will be fighting the always tough Jayson Velez in a scheduled 10 round fight on April 26 with his eyes on facing IBF super featherweight champion Tevin Farmer after that in his next fight. It’s virtually academic that former WBA super bantamweight champion Quigg (35-2-2, 26 KOs) will get the title shot against IBF 130 lb champion Farmer (29-4-1, 6 KOs), provided that he beats Velez (28-5-1, 20 KOs) on the 26th of April when the two face each other on DAZN at The Forum in Inglewood, California. This is a Mathroom Boxing show put together by the popular British promoter Eddie Hearn, whose goal is to become the #1 promoter in U.S in the same he did recently in the UK. Although many fans scoffed when they heard the young promoter Hearn predict how he was going to take over boxing in the U.S a year ago, but he’s quickly signed a lot of talented fighters, and he’s well on his way to accomplishing his goal. Quigg will be fighting the 31-year-old Velez on the undercard of the super flyweight match between WBC 115 lb champion Srisaket Sor Rungvisai vs. Juan Francisco Estrada. This is an important fight for Quigg, who was beaten soundly last year by WBO featherweight champion Oscar Valdez by a 12 round unanimous decision on March 10, 2018. Quigg suffered a broken nose in losing by the scores 118-110, 117-111 and 117-111. It was also a costly fight for Valdez, as his jaw was broken in the fifth round by a hard right hand from Quigg. For the remainder of the fight, Valdez fought with his mouth open with blood streaming out of it. The fight arguably should have been stopped at some point as a precaution to prevent a serious injury to Valdez, but it was allowed to continue for the full 12 round. Valdez boxed Quigg for the last half of the fight and did an excellent job of minimizing the amount of shots that he was able to land. The difference between the pedigree of the two-time Olympian Valdez and Quigg was apparent throughout the contest. Valdez was much more skilled, and made the fight look easy in the second half. 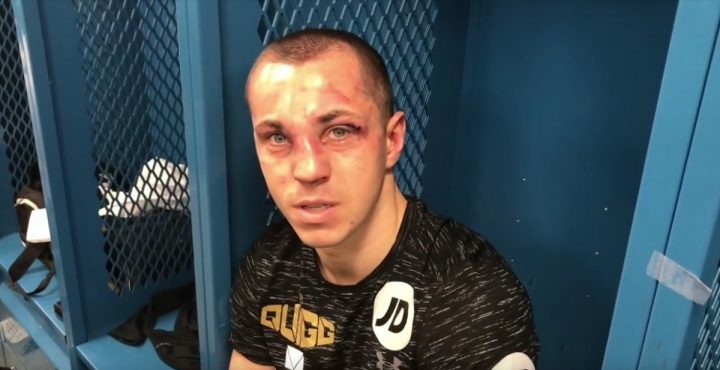 Quigg came back seven months later, after his broken nose had healed, to defeat journeyman Mario Briones by a second round knockout last October. Quigg showed no signs of his previous loss to Valdez in beating Briones. It was a good performance by Quigg, albeit against a guy that came into the fight having been knocked out in two out of his last three fights. Beating Briones was nice, but it didn’t tell us anything about whether Quigg has the talent to compete against the best at super featherweight. Quigg’s loss to Valdez showed that he’s not good enough to beat the elite at featherweight. Having failed at 126 to capture a world title, Quigg is going to try his hand at winning a world title at super featherweight when Hearn matched him against IBF champion Tevin Farmer, provided he beats Jayson Velez on April 26. Velez was beaten last May by Ryan ‘Kingry’ Garcia by a one-sided 10 round unanimous decision. Velez came back from that loss to beat Orlando Cruz and Victor Terrazas. Both of those guys were talented fighters in their youth, but they’re now up there in age at 37 and 36-years-old respectively. Terrazas (38-6-2, 21 KOs) is a former WBC super bantamweight champion, who isn’t the same fighter he used to be. Trained by Freddie Roach, Quigg will likely have little problems beating Velez. This is another tune-up level fight for Quigg, but it looks like Hearn doesn’t want to put him in against anyone that could potentially beat him at super featherweight before he matches him against Farmer. There are some contenders at super featherweight that would give Quigg a lot of problems like Eduardo “Rocky” Hernandez, Rene Alvarado, Miguel Roman and Joseph Diaz. Velez has pretty good punching power, and he does well typically against sluggers. If Quigg comes to punch with Velez, we’re going to see a lot of fireworks in this fight on April 26. Farmer is one of the beatable champions at super featherweight. If Quigg can face him, he’s got a good chance of beating him. It’ll be tougher task if Quigg were to fight WBA Super World champion Gervonta “Tank” Davis, WBA ‘regular’ champion Andrew Cancio or WBC champion Miguel Berchelt. Those guys are all solid champions that would give the slugger Quigg a lot of problems. If Quigg struggles to beat Velez, it’ll be a bad sign in predicting how well he’ll do when he challenges Farmer later this year. Velez is someone that Quigg needs to be able to beat with ease for him to prove that he can hang with the best in the division. If things don’t workout well for Quigg against Velez, his promoter Hearn will need to have him target Cancio for his WBA super featherweight title or WBO champion Masayuki Ito.